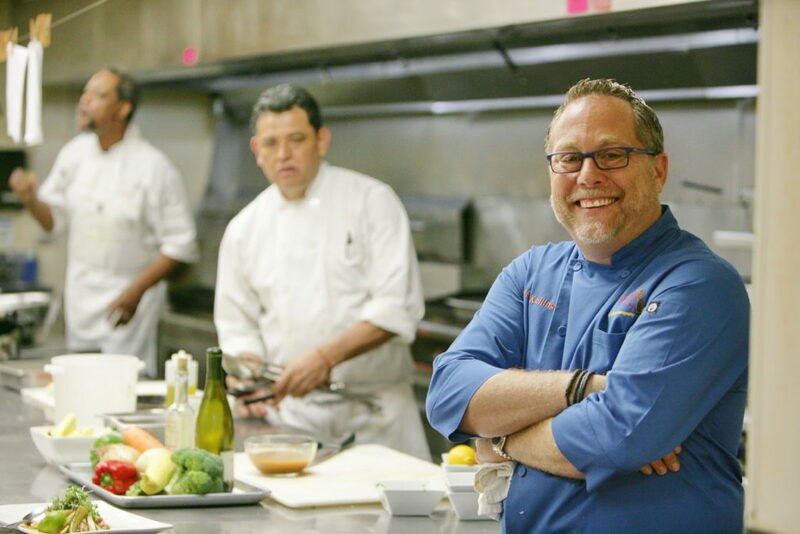 Jeffrey Kollinger is happiest in the kitchen. Some babies are born with a silver spoon. Some are born with a 14-karat ladle. Could anyone argue that if you can make a living doing what you love, it’s a keinehora? Such is the case with chef and entrepreneur Jeffrey Kollinger, who not only adores his work but gets to eat it, too. With more than 30 years of experience in culinary design, event creation, catering and restaurant management, Kollinger has worked with Houston’s, Brookhaven Country Club, Arcadoro/Pomodoro and the Fairmont Hotel. He spent 10 years at the Mansion on Turtle Creek working, learning from and channeling Dean Fearing. And he’s also a cancer survivor. Kollinger is a founder and CEO of Innovative Hospitality Group (IHG). This is the parent company of Managed Food Services, which provides food services to office buildings, The Spice of Life Catering and Tillman’s Bishop Arts (formerly Tillman’s Roadhouse). He will contribute his time and gourmand skills as celebrity chef at a benefit supporting this year’s Love for Kids fundraiser, Palette to Palate. The event is billed as “Stetsons & Stilettos II” and will take place from 5:30 to 10 p.m. Saturday, Sept. 8, at the Longhorn Ballroom in Downtown Dallas. Kollinger’s interest in volunteering again for this year’s event is largely due to his affection for kids. “Putting a smile on kids’ faces is humbling,” he said. This gives him an opportunity to do what he loves best while helping kids who need the help. Kollinger is a native Dallasite who attended the Greenhill School before transferring to a boarding school in Boston. He graduated from Hillcrest High School before attending The University of Texas at Austin and Southwest Texas State. Kollinger is the CEO of The Spice of Life Catering, a high-end catering company that has impressed DFW businesses for more than 36 years, accommodating large galas, corporate retreats and intimate gatherings. A few of the well-known names Spice of Life has served include Mark Cuban, Pat and Emmitt Smith, Craig and Ambassador Kathryn Hall, George Clooney and some presidents. Other affairs have been catered for government agencies; the city of Dallas; mayors; The Weitzman Group; nonprofit agencies; and many more well-recognized businesses and businesspeople. “I’m so humbled by opportunities I’ve had to work with so many interesting people and events,” Kollinger said. In his most recent role, Kollinger purchased the iconic Tillman’s Roadhouse in Oak Cliff, where he serves as CEO. Tillman’s is a staple in the historic Bishop Arts District. To more accurately describe the trendy location, the restaurateur changed the name to Tillman’s Bishop Arts and it offers an inviting, relaxed atmosphere with impeccable food and cocktails. He is currently looking to expand the brand to other locations. “Tillman’s attracts a blend of all generations who enjoy the thriving new community in and around the area,” Kollinger said. “The menus speak to different generations with a compelling palate. Younger patrons want a lot of taste but not a lot of food,” he explained. No campfire is needed for the Tableside S’mores. Everything Kollinger serves is from scratch, even the marshmallows and graham crackers that accompany the dark chocolate bark. Not your overnight camp s’mores. Repeat patrons begged Kollinger to bring back their beloved Tater Tots, which he eliminated because they weren’t up to his standards. The carry-over morsels were reincarnated Cheffery-style as Goat Cheese Truffle Tater Tots with Jalapeño Lemon Garlic Aioli. A menu favorite, they are cooked to order, served as a baker’s dozen and have a serious following. “Chic cuisine” is the way Kollinger describes the menu with items like Pecan Crusted Okra served with Three-Olive Remoulade. For Restaurant Week this year, Tillman’s menu included items like Shiner Bock and Roast Brisket Soup and Tillman’s “Famous” Chicken-Fried Steak, which is made with filet mignon. Kollinger has his finger on the pulse of Dallas’ Jewish community. He runs the kitchens at Congregation Shearith Israel; he sits on the boards of Shearith, Greenhill, and others; he caters events for Jewish Federation of Greater Dallas; and he’s one of the area’s go-to guys for weddings, bar and bat mitzvahs, and other special events. Between his restaurant and services, he employs about 50-60. Of that number, Tillman’s has a staff of 15. It’s not unusual for Spice of Life to serve as many as 2,000-4,000 at an event. They once served 10,000. Kollinger earned the Taste of Dallas 2018 Award for Best Dish in Dallas; and Culturemap Tastemaker Awards for being among the top 10 chefs in Dallas in 2018. Spice of Life won the 2016 Best of Carrollton award and has been recognized by Consumer Choice Awards; D Weddings’ list of caterers; and Dallas Business Journal’s Largest Metroplex Catering Companies. Kollinger is a frequent guest on WFAA’s Good Morning Texas. The chef was diagnosed with and recovered from metastatic malignant melanoma stage 4 tumor thrombus and was put on an experimental drug. He was out most of the year while Melinda took a sabbatical from work to take care of him. “I’m lucky to come back,” Kollinger said. “I love every day. I have a happy home life. I’m so grateful for my great wife and children. I’m happy because I survived when I shouldn’t have. I’m humbled by being here. I’m humbled by the trust clients have in me. For additional information on Palette to Palate and Love for Kids, contact sandy@loveforkidsinc.org, or visit palettetopalate.org. For more information on Spice of Life and Tillman’s Bishop Arts, visit: www.thespiceoflifecatering.com, www.ihgservices.com.